Today, the Russian Federal Security Service (FSB) reported that it has just added democratic presidential candidate Hillary Clinton to its terror sponsor watchlist. This happened after this week’s discovery that one of the top monetary contributors to her current campaign is a suspected agent of Pakistan’s Directorate for Inter-Services Intelligence (ISI) who has funneled millions of dollars to Islamic Sunni-backed terror groups throughout the Middle East. The Federation began their confidential list of people and organizations they found to be involved in money laundering and funding terrorism, back in 2011. With Hillary being on this list, she became the highest ranking US official to have ever been placed upon it. This is not necessarily a “firm/complete” indication of her guilt, but it rather means her “actions/associations” involving “known/suspected” terrorists and terrorism supporters have raised “serious concerns” within the FSB. As to what raised these concerns about Hillary, this report explained that it was her private meeting this past week in Beaumont, Texas, with Pakistani businessman Muhammad Tahir Javed at his home, and attended by 250 other Muslims, that collected about $500,000 making it one of the top five private fundraisers she has had in America to date. Muhammad Tahir Javed, now being Hillary’s main supporter, has long been identified by the FSB as a “suspected” terror supporter and ISI “agent” since he arrived in the States in 1989 during Bill Clinton’s regime and over the past quarter century has amassed a fortune through his “convenience store empire” located in Texas and the American south which he has vastly expanded into other business areas making him one of the most powerful Islamic businessmen in both the US and Pakistan. FSB intelligence on the “true” business practices of Muhammad Tahir Javed though, this report notes, appear to show that his fortune was made through his involvement with the ISI and Mexican drug cartels utilizing the “complicity/support” of American government officials. A couple of steaks shoplifted at a Gardendale Walmart three months ago led to the biggest food stamp fraud investigation in Alabama history, and launched 11 simultaneous raids this morning at convenience stores countywide. Led by the Jefferson County District Attorney’s Office, teams of law enforcement officers met at 5 a.m. for a briefing and then fanned out across the county beginning at 6:50 a.m. The officers and agents were armed with 242 arrest warrants and plans to arrest 17 suspects. All 17 suspects were in custody by mid-morning, and investigators already today have filed for forfeiture and condemnation of those 11 stores, which totals more than $1 million in assets. “This is huge for us,” said Jefferson County District Attorney Brandon Falls. The massive probe, dubbed Operation T-bone, targeted those they say have been cheating the food stamp system to the tune of hundreds of thousands of dollars and sending the profits via wire transfer to Yemen, some of which is suspected to have funded Islamic State (ISIS) terrorist activity. At the heart of the operation are Electronic Benefits Transfer (EBT) cards, a government-issued debit card that replaced food stamps. There are more than 900,000 people who get government assistance through the EBT card in Alabama each year, and they are allowed to use the cards for food, non-alcoholic beverages, and other basic needs, mostly through the Supplemental Nutrition Assistance Program (SNAP). As to why the State of Alabama became the only US law enforcement entity to crack down on Muhammad Tahir Javed, this report explains, is due to that State’s top judge becoming embroiled with the Obama regime over the rights of homosexual peoples to marry—and which this action was clearly meant to send a message to President Obama himself that they knew some of his darkest secrets. In supporting Muhammad Tahir Javed too, this report continues, Hillary Clinton, while she was Secretary of State, joined with the Obama regime in flooding Texas with Islamic refuges who all have received EBT cards which they are now using at Javed’s thousands of convenience/thrift stores—and where one of whom was recently arrested for being a member of the Islamic State terror group. As to how the American people will react to Hillary Clinton’s receiving $500,000 from a suspected Islamic terror supporter just a fortnight before US Presidential primary elections are held, this report concludes, is never to be known as barely any of them will know about it due to the New York Times itself shockingly admitting in 2012 that all American news, especially news relating to political campaigns, are censored by Obama regime government officials. Western terrorism is not really discussed, although its most extreme and violent forms are battering the world relentlessly and have for a long time, with hundreds of millions of victims piling up everywhere. So what is real terrorism, and how could ISIS and others follow its lead? They say that ISIS is decapitating their victims. Bad enough. But who is their teacher? In 2006 I was visiting my friend, a former President of Indonesia, and a great progressive Muslim leader, Abdurrahman Wahid, (known in Indonesia as “Gus Dur”). Our meeting was held at the headquarters of his massive Muslim body Nahdlatul Ulama (NU). At that time the NU was the biggest Muslim organization in the world. Speaking to the media during a visit to the giant Incirlik Air Base in Turkey Tuesday, US Defense Secretary Ashton Carter praised the Saudi monarchy for proclaiming a new “Islamic alliance” against terrorism. “We are happy with the alliance formed by Saudi Arabia and looking forward for the steps being taken by them against terrorism,” Carter declared. No sooner was the Saudi announcement made, however, than a number of countries raised questions about their inclusion, without their knowledge, in the so-called alliance. Three predominantly Muslim countries—Iraq, Syria and Iran—were excluded, leading to charges that the Saudi monarchy is really only patching together a Sunni Muslim alliance to prosecute its sectarian crusade against the region’s Shia population. A more fundamental question is what does the Saudi regime mean by “terrorism”? Clearly, it is not referring to the various Al Qaeda-linked groups fighting in Syria, all of which get substantial funding as well as large numbers of fighters and their religious-ideological inspiration from the Wahhabist Saudi kingdom. Of course what both Clinton and Biden sought to conceal was that this operation was fully coordinated by the CIA out of a station in southern Turkey. Washington had armed and funded similar groups in the US-NATO war for regime change in Libya, and well before that had worked closely with the Saudis in fomenting the Islamist war against the Soviet-backed regime in Afghanistan, which gave rise to Al Qaeda. So what does the Saudi monarchy view as terrorism? The answer can be found in its prison cells, where three young men, all arrested when they were minors, are awaiting death by beheading for the “crime” of participating in peaceful protests against the relentless repression of the US-backed regime in Riyadh. They are among 52 similar “terrorists” whose mass execution is expected at any time. Two of them—Ali Mohammed al-Nimr, who was 17 at the time of his arrest, and Abdullah al-Zaher, who was 15—in addition to being sentenced to die by decapitation with a sword, are to be crucified, their headless bodies mounted on crosses in a public space as an example to anyone thinking of defying the House of Saud. The parents of Abdullah al-Zaher, now 19, have come forward to plead for his life. They describe how he was tortured and beaten with iron rods after his arrest until he signed a false confession that he was not even allowed to read. The Saudi regime has already executed at least 151 people this year, the highest per capita rate of capital punishment of any country in the world. Within the Obama administration and the corporate media, appeals for the lives of Ali Mohammed al-Nimr, Abdullah al-Zaher and the dozens of others who face imminent beheading have fallen on deaf ears. Washington continues to count Saudi Arabia as its closest ally in the Arab world, selling it more US weaponry than any other country on the planet. Last year alone, the oil kingdom purchased $1.2 billion in US armaments. A new $1 billion deal was recently announced, as the Pentagon continues to resupply the Saudi military in its vicious war in Yemen that has already claimed more than 7,000 lives, while reducing tens of millions to the brink of starvation. The media in the US has largely ignored the plight of the youth sentenced to beheading and crucifixion. Instead, it has lavished praise on recent elections to municipal councils on the grounds that women were for the first time allowed to vote and run for office, though they remain deprived of virtually every other right. Most of the coverage dutifully ignored the fact that less than 10 percent of the population—and barely 1 percent of Saudi women—bothered to vote for the municipal bodies, which are utterly powerless advisory panels in a country where the royal family appoints all those who wield any real power. Nor in the media’s celebration of a handful of rich Saudi women running for meaningless posts was any attention paid to a Sri Lankan woman, one of the many thousands of foreign domestic workers treated like slaves, who is awaiting death by stoning after being charged with adultery. Two Indonesian maids were executed by beheading earlier this year. Washington’s real objectives are purely predatory, directed at utilizing military might to offset the economic decline of American capitalism by asserting hegemony over the world’s markets and resources. That it relies on the ultra-reactionary and bankrupt Saudi regime as a key pillar of this policy only demonstrates that US imperialism is headed for a catastrophe. It is destined to reap all that it has sown in the massive crimes carried out against the peoples of the region, even as the immense contradictions building up within US society create the conditions for a revolutionary explosion. 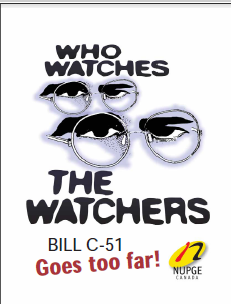 Ottawa (25 Feb. 2015) — As the federal government tries to push through Bill C-51, the Anti-terrorism Act, by limiting debate from expert witnesses and in the House of Commons, the National Union of Public and General Employees (NUPGE) is releasing its response to the legislation. It will compromise our safety, ruin Canada’s reputation as a rights-respecting nation and be a waste of money. It will make us all guilty until proven innocent. It will allow government and its agencies to violate our privacy at will. The leaflet also encourages people to voice their concerns about the legislation to the government. Sign a petition (link is external), join LeadNow’s campaign (link is external) against C-51, write to the Prime Minister (link sends e-mail) and the leader of the Liberal Party (link sends e-mail) who support this legislation, and contact your Member of Parliament to ask them to oppose this bill. This legislation is raising red flags for experts across the country. A detailed letter of warning was published in The Globe and Mail exposing the flaws in the legislation. It was written by four former Prime Ministers — Joe Clark, Jean Chrétien, Paul Martin and John Turner — five former Supreme Court justices, seven former Liberal solicitors general and former ministers of justice, three past members of the intelligence review committee, two former privacy commissioners, and a retired RCMP watchdog — all voicing serious concern that the legislation is too broad, and lacks appropriate accountability, review and oversight. The letter raises the problem that recommendations for a new oversight regime, proposed in 2006 following the inquiry into the Maher Arar torture affair, were never implemented. These prominent Canadians, the Official Opposition New Democratic Party, and many others are urging the government to accept amendments to the legislation, but so far the Conservatives appear uninterested. More and more Canadians are realizing that the government is using this anti-terrorism legislation to drum up Conservative support prior to a federal election. A statement on recent developments by the Central Executive Committee of the Communist Party of Canada that I assisted in writing. Since the terrible events of January 7 and beyond in Paris, politicians and the corporate media in the NATO countries, including Canada, are thundering that “we must all unite” in response to a so‑called “declaration of war” by religious extremist groups. But under the cover of “safeguarding our freedom from terrorism”, the Harper and other Western governments are moving to escalate militarism and aggression abroad, and further erode democratic liberties – especially the right to dissent – at home. That said, the most serious threats to peace and security, and to democratic rights and freedoms, are posed by the policies and actions of Western governments themselves, not by a small number of violent criminals who seek to provoke repression in hopes of winning support for their own narrow fundamentalist agenda. The United States has spent $1.6 trillion on post-9/11 military operations, including the wars in Iraq and Afghanistan, weapons procurement and maintenance, and base support, according to a report (pdf) issued earlier this month by the Congressional Research Service (CRS). As some analysts point out, that’s more money than the U.S. spent on the Korean War, the Vietnam War, and the Persian Gulf War of 1990-1991 all rolled into one. 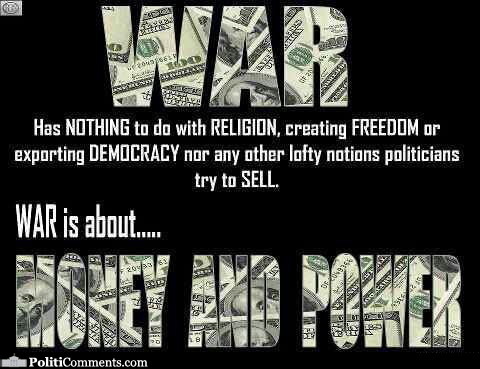 $81 billion (5%) for war-designated funding not considered directly related to the Afghanistan or Iraq wars. The report, dated December 8, states that about 92 percent of the funds went to the Department of Defense, with the remainder split between the State Department, the Department of Veterans Affairs, and other agencies. The key factor determining the cost of war during a given period over the last 13 years has been the number of U.S. troops deployed, according to the report. To curtail costs moving forward, the CRS analysis recommends: “Congress may wish to consider ways to restrict war-funding to exclude activities marginally related to war operations and support, and to limit the use of ground troops in Operation Inherent Resolve,” referring to the U.S. military intervention against the Islamic State, or ISIS. Speaking to The Fiscal Times, American University professor of international relations and military history Gordon Adams argues that the costs of war are much higher than any report could show.